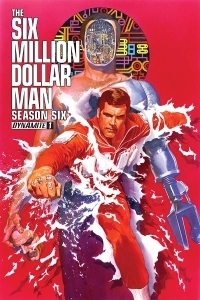 The Six Million Dollar Man, Season Six #1 comes out thirty six years after the last episode aired. Firefly fans, don’t you EVER complain to me about waiting for a TV show to get picked up for another season. So, was it worth the wait? Writer Jim Kuhoric manages to pack SO much from the both the television series AND the 1970s, it’s almost unbelievable. For a first issue, he spends VERY little time introducing characters and setting them up. He lets the television intro do that for him, and that gives us everything we need to get going. 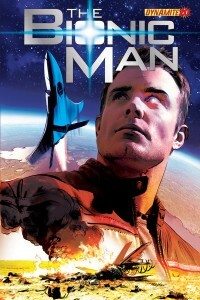 What he does include, is numerous mentions to the past history of the characters that were depicted in previous episodes, which is fun for those of us who remember and revisit the episodes, but it’s in no way, shape, or form off-putting to readers who are picking this up for the first time. 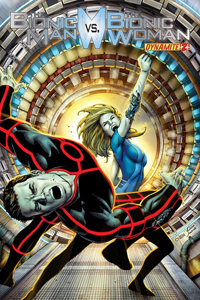 The Bionic Man #20 picks up right where the last issue left off. We’ve got Steve halfway around the world, trying to stop the launch of a missile that could do some irreparable damage. Aaron Gilespie is really hitting his groove on this title. He’s constantly gotten better and better at writing this book. In the past, his plots have been less than spectacular, but now they’re actually really interesting and entertaining. 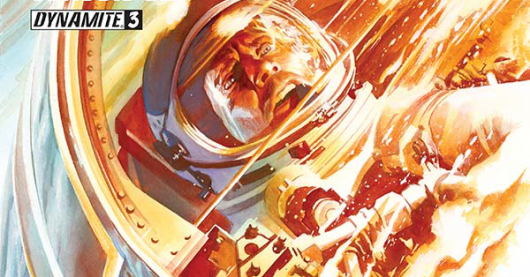 Combine that with some great dialogue for Steve Austin and you’ve got a very enjoyable comic. This issue in particular, might be his best yet. His portrayal of Steve is really well done, with all the classic hallmark humor, and intensity that Lee Majors brought to the role almost 40 years ago. Well done Mr. Gilespie! 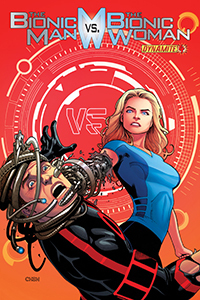 The Bionic Man #18 is another in a string of fun issues. One thing that I love is that this book doesn’t take itself seriously at all. Yes, it’s an action comic. Yes, it’s a super hero comic. But, it’s played tongue and cheek, and at the end of the day is really entertaining. Aaron Gillespie turns in an actually quite thrilling script for this second part of the “Desert Deathtrap” storyline. Steve goes undercover, WAY undercover, in Jardan to take out an evil dictator. Gillespie goes a GREAT job when it comes to writing the spy game, and you’ll find yourself lost in the story really quick. Another one of the strengths in this issue is that it doesn’t read in 5 minutes. It’s a nice, meaty story with lots of detail and twists and turns. My only complaint would be that it’s a little lighter than I’d like in the bionics department. I mean, c’mon, he IS called the Bionic Man. If I wanted a straight-up spy book, I’d read something else. But, it doesn’t take anything away from the book, as I mentioned earlier, it’s really a quite fun and really enjoyable. 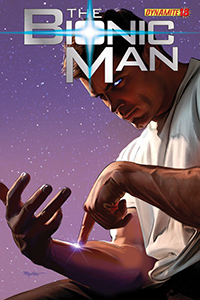 The Bionic Man #17 is a terrific action-adventure comic that totally works. Yes, almost every comic has action, but sometimes it’s hard to pull off. Thanks to the creative team, there are NO problems here. Aaron Gillespie‘s writing is quickly improving with each issue. I don’t think he’s ever been a bad writer on this title, but some of his previous issues were a little lacking in the action department. That’s not the case here and #17 is pretty much wall to wall action and excitement. 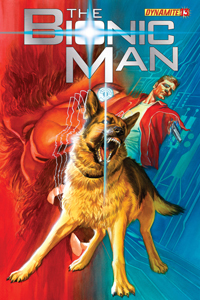 It’s got all the hallmarks of The Six Million Dollar Man TV series, just set in modern times and having Steve dealing with real world situations that are going on now. Great stuff! 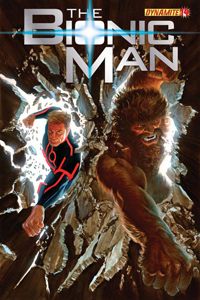 The Bionic Man #14 features Steve Austin and Bigfoot. Do I really need to say anything else? Phil Hester and Aaron Gillespie are REALLY turning things up a notch. For the first time, I’m getting the feeling that Steve Austin has a REAL personality and has a unique voice and character. And that voice and character is AWESOME!!! This issue is jam packed with goodness. You’ve got Steve Austin TEAMING UP with Bigfoot to take on a secret organization that builds robot Bigfoots. Yes, it’s as awesome as it sounds. The only thing that bothered me is Steve’s relationship with OSI and Oscar Goldman. 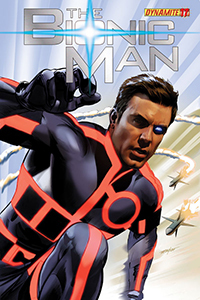 Several characters state that Austin no longer works for OSI, yet he keeps going back there for repairs, missions, and other various things. But, that’s just a tiny glitch in what is a fantastic story. 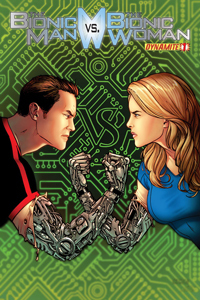 The Bionic Man #13 continues the story that everyone’s been waiting for. Bigfoot. The creative team has taken a lot of liberties with this one, and it really pays off. They blindside you with more surprises than you can handle. And hey, it’s Bigfoot. Writers Phil Hester and Aaron Gillespie really hit their marks this issue. It’s the second chapter in the Bigfoot storyline and it shows NO signs of slowing down. There’s some great twists and turns that you’ll never see coming, as well as a healthy mix of mystery, action, and surprises. In fact, the last couple of pages are quite shocking, and it’ll have you counting the days until the next issue. After the end of Kevin Smith’s adapted screenplay in this title, I was very afraid that the title would flounder around looking for its own identity, but thanks to Phil Hester, it has flown seamlessly into a fantastic title that I want to read every month, no exceptions. And, this going beyond my love for the franchise, this is a very entertaining comic, that excels because it doesn’t pretend to be something it’s not. Look at the title and you know what you’re getting into, the writers know that and give you exactly what you want.